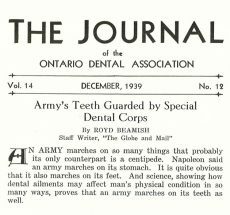 With the outbreak of the Second World War in 1939, the Ontario Dental Association (ODA) took action much as it had in 1914 during the First World War. 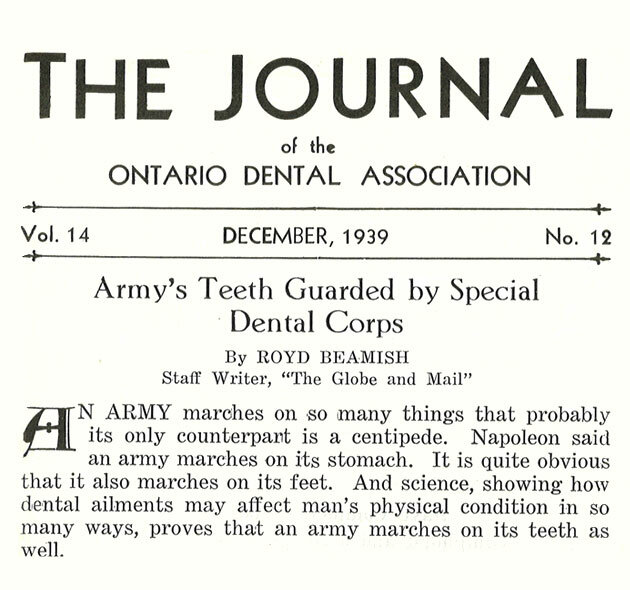 At the May 1940 ODA meeting, it was announced that dentistry's contribution to the cause would be supplying sufficient men to staff the Canadian Dental Corps. President Dr. George V. Morton made a call for a “sacrifice for the common good” and strived to inspire members who hadn’t already enlisted to join the fight. Many of the ODA's most experienced members joined the armed forces, which by this time had formed 24 dental companies comprised of 24 officers and 80 men. The No. 1 Field Dental Company had left Canada late in December 1939 with the First Canadian Infantry Division, but as the war spread, additional dental detachments served in France, Iceland, Sicily and Italy. The Canadian Dental Corps grew to 1,562 dental officers with 3,725 enlisted personnel of whom 748 officers and 1,747 enlisted personnel served overseas. Before the war ended, 14 of those officers and 19 enlisted personnel were killed or had died in active service. Today, the Royal Canadian Dental Corps, which consists of dentists from across Canada, continues the tradition of providing high-quality dental care at home and abroad for Canada’s Armed Forces. 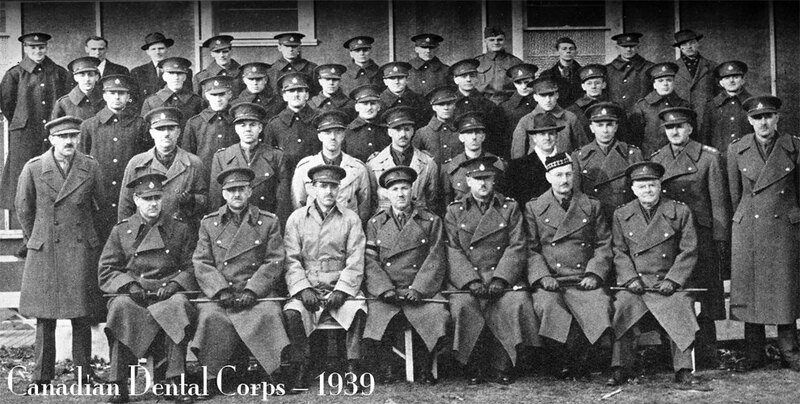 To learn more about the history of the Royal Canadian Dental Corps please visit the Canadian Dental Association website.